Will Defense Cuts Hurt Innovation? 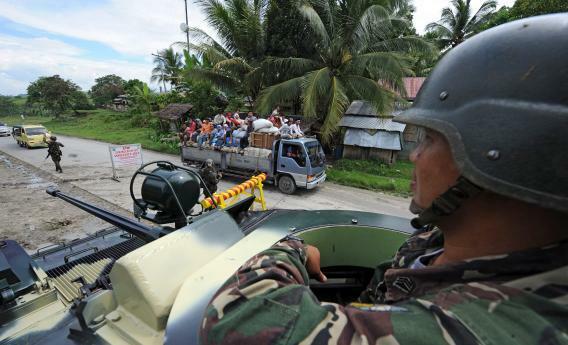 A Philippine soldier (R) aboard an armored personnel carrier (APC) watches a truck loaded with passengers at a military check point in the town of Datu Piang in the southern Philippine province of Maguindanao on Mindanao island on September 5, 2011. The United States spends a lot of money on “defense” which both directly and indirectly finances a lot of research and development into defense-related technologies many of which have broader economic applications. So with the Pentagon looking at some budget cuts, it’s not surprising to see some voices raising the concern that these cuts will reduce innovation. A few notes on this. One is that the level of true R&D spending in the Pentagon budget is smaller than the headline number suggests. But even so, the spending is spending. Everyone knows that if you invent a really amazing remotely piloted aircraft with specialized abilities in the field of blowing things up that the United States government is a large potential customer for said aircraft. That induces private research into the relevant technologies, and if we reduce acquisition spending that will have downstream consequences. But the question we need to ask about this is how elastic do we think the supply of innovators is. Maybe if spending on military robotics declines, reducing the total returns to robotics-related innovation, the we’ll have many fewer people going into robotics and way less innovation. Maybe they’ll teach yoga instead. But maybe if spending on military robotics declines then our most talented roboticists will focus more of their time and attention on civilian applications. The people who make the Roomba also make the PakBot for the military. To an extent, PakBot spending supports the existence of the firm and attracts capital to the industry, spurring the development of Roombas. But to an extent the PakBot simply diverts engineers away from thinking about how to make better Roombas and into thinking about how to make better PakBots. In other words, there’s an incentive effect here and a crowding out effect. My suspicion is that the crowding out effect dominates. If you take an extreme case like World War II it’s clear that by gathering a huge share of the top minds in physics together and making them collaborate on the Manhattan Project, you can do impressive things. But the Manhattan Project didn’t call the impressive people together. What it did was divert them from whatever other courses of research they would have been undertaking and focus it on the question of how to make a really enormous explosion. As it happens, at the time we had very good reason to divert scientific talent into bomb-making. But the reason to do it was that we had a really specific time-sensitive need for better bombs, not that investing in bomb-building increased the overall pace of scientific progress.